“There are times when I desire a sweet, hefty bourbon, or perhaps a lovely pot stilled Irish, maybe even a nicely sherried Speyside malt. But today, friends, today nothing less than the tar soaked, burning brine and wispy salty sea, the peat fueled fire cooking a kettle of kipper on top of the mountains of Islay overlooking smoke from the victory fire of a mighty Nordic war party, yes friends, nothing less than the Hell Fire aromas of Laphroaig will do tonight.” – Me, said below my breath as I walked into the liquor store yesterday. Laphroaig 18 is matured 100% in first fill ex-bourbon casks sourced exclusively from Maker’s Mark. Although I am fairly certain that Laphroaig is caramel colored, I am 100% certain that our selection today is not chill-filtered and is bottled at a God blessed 48% ABV. Right on, brother. 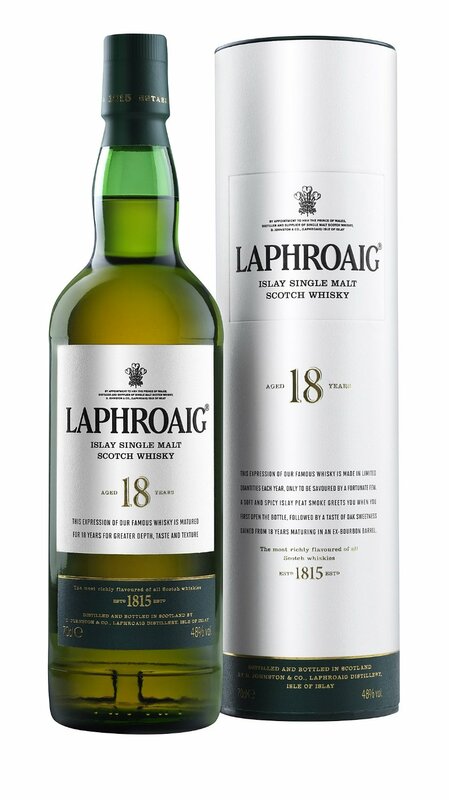 So for you sick, twisted, soon to be arrested for your sinful desires peat loving freak people, here is our review of Laphroaig 18 year old single malt. Nose- Nice calm balance between toasted cereal, medicinal peat with antiseptic, mossy, pine and the sweet notes of creamy toffee, oak and fruit. Lovely, full flavors behind the smoke. Taste- Sweet and lively with fruit (citrus and lemon) and honey. Develops into a smoky, savory feel. Finish- Long, lingering notes of smoke and cereal. Some hints of citrus and pine/straw. Comments- Certainly not the ferocious 10 year old, but there is a great balance between the smoke and the nicely developed flavors behind it. A very lovely sip. Recommended.